Alright, London, you've finally got something to cheer about in the food delivery realm. It's been a long time in the making but it seems things are finally right on track. For years, I've had New Yorkers staying with me as I've moved around the Big Smoke and they've always been so confused as to why we couldn't get the idea of food delivery just right. How difficult can it be to have someone deliver a piping hot meal to your house? Well, for a long time it seemed this city just wasn't on track for making that happen past Domino's and Papa Johns. If pizza places can do it, why can't everyone else? 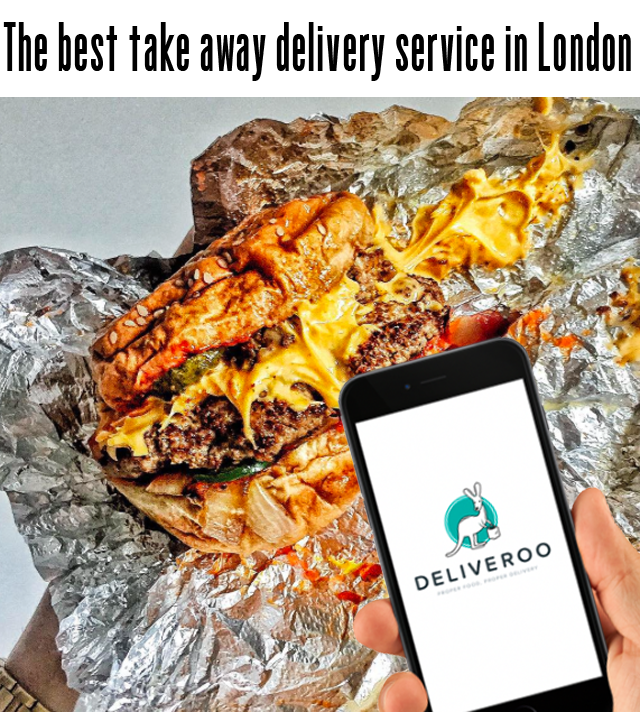 Of course, with the launch of the iPhone, apps were introduced that made this whole delivery thing a little easier, and over the past year I've written about a few of those apps that are changing the way we order food in London. All of the sudden we can be the laziest you-know-whats in the world and even order McDonalds to be delivered to our front door 24/7. Only problem is that some of these apps weren't ready to take on the demand that was out there for their services. With the launch of each new food delivery app came a new let down, over time. Food would take two hours to arrive, and sometimes it wouldn't arrive at all. There were excuses as to why it was late, refunds offered or "forgive me" gestures made - but each app seemed to promise more than it could ever deliver, literally. I had had enough. I decided food in London was just going to be something I go out for or stick with the pizza chains when it came to home delivery. Then, my bestie Letty told me to give Deliveroo a try. The app on my phone tells me what's local to me. Deliveroo realize they can't deliver a great service if they give you every option in London, so they restrict your offering to local restaurants. Not to fear, there's still plenty on offer. I guarantee you'll be spoilt for choice. You choose what takes your fancy and you decide on a time that you want it delivered. You can opt for ASAP and there will be an estimated time of delivery in a circle under that restaurant - so you know exactly what you're in for with waiting times. Alternatively, you can designate a time for delivery - I love this option. On the app, you can make special requests, leave tips and track your driver on his journey. You're shown every step of the way what's happening with your order, as if you were there yourself. Then, a polite driver arrives at your door and hands over a hot meal for your lazy-arse and you feel like an absolute princess. Yeah, it's pretty much as easy as all that. Deliveroo is truly the best delivery service I've encountered yet in London - hence the shout out. I know so many of us are getting frustrated by less than stellar service when it comes to food here in town. So I thought I'd just give a small shout out and let you know that my current number on the scale has been greatly increased by the appearance of Deliveroo in my life. This is not good at all, people. But, everything in moderation, right? This is in no way a paid for promotion, just a simple notification to all that this is a good, reliable and safe service that has exceeding all of my expectations and deserves recognition. Enough said. Go forth and overindulge. You only live once, right?